Home » Website Building » Weebly » How to Create Free Weebly Forum Site? How to Create Free Weebly Forum Site? Weebly removed the Tal.ki forum element, this article is no more valid and left for historical reference. If you are looking for inserting form in Weebly site then navigate to the article on how to embed nabble forum in Weebly site. What are the Forum Options in Weebly? Forum is a simple and free tool allows the visitors to interact with both you and other visitors. Generally forums are used to discuss a particular topic in detail. Weebly offers built in forum provided by the third party Tal.ki. If you want to use another forum, you can embed the same using embed code element. There are free forum providers like Nabble and Lefora offer embeddable forum codes with more features for free than Tal.ki. How to add Tal.ki Forum in Weebly Site? Select the site in which you want to add a forum. In Weebly editor under “Build” tab, click on “More” category. Drag and drop “Forums” element to your content area. That’s it!!! Now forum is enabled in your Weebly site and it’s free. Weebly does not have any control over the embedded forum which is offered by a third party provider called Tal.Ki. The forum is common across account which means once you enabled the forum in any of your site, it is common across all the ten sites in your account. Forum features are common for pro and free users which means pro users will not get any additional features. You can see various links in the top and click on the “Forum Admin” link. 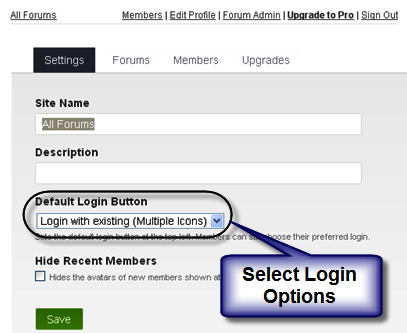 Under Settings tab select the way you wanted your members to log in to your forum. It is mandatory for the users to log in either with Weebly account or other means like Facebook. After you start a topic, any of your members will be able to post new content to that topic while they are reading it. Maximum of five sub-forums can be added with a free Weebly Forum. 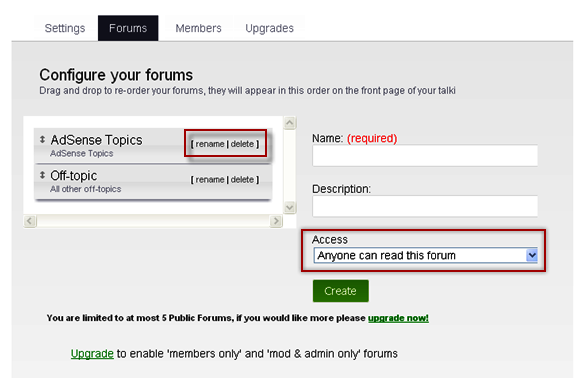 Create new topics, edit existing topic’s name and control the forum access under Forums tab. Creating a Forum post is very simple task in Weebly by just clicking on the Start a topic button. You have three additional options Subscribe, Sticky and Closed after done with posting your topic. Subscribing a topic will enable you to receive notification of new replies via email. Sticky is the useful feature for Administrator or Moderator which enables you to always keep the post at the top of the forums so all the members will see it. For example posts related to new announcements, policy of usage and terms & conditions can be made as Sticky to keep it always on top. Administrator or Moderator can anytime remove this option by editing the topic. Closed option is used to lock the topic to avoid any new reply on that. 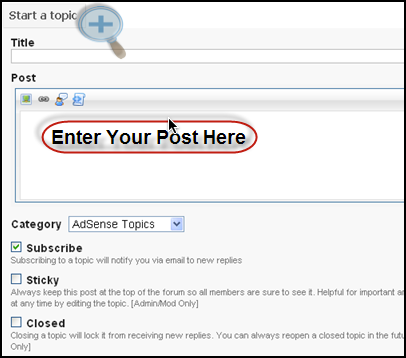 Admin or Moderator of the forum can anytime reopen the closed topic by editing the topic. You can also edit or delete any forum posts after publishing as a forum admin. Here are the limitations of free Weebly forum offered by Tal.ki, read and understand before you are trying with Weebly forum. You can create maximum of five sub-forums in your Weebly forum site. If you want more than five sub-forums then you need to upgrade your Tal.ki forum account separately. (Learn more about a forum site structure here). Free Tal.ki forum will display only the last 15 topics posted on your forum. Other hided topics can be accessed only through forum search or using direct topic link. This makes real difficult for the webmasters having considerable number of topics under single sub-forum. Moreover, each single topic is restricted to maximum of 200 replies and you will not get a backup copy of topics when it is deleted. This means if you deleted any topics by mistake then there is no way you can recover the content. Every Weebly account has one Tal.ki forum attached to it and there is no way to delete your forum permanently once you enabled it in your site. Deleting the forum element will not delete the content of the forum which means whenever you drag and drop the “Forums” element, your forum will get automatically loaded with previous topics. Since free forum does not have an option to restrict user’s access, anyone can access your forum posts and become a registered member using any social networking credentials to upload their spam content. Tal.ki forum only sends the notification on topics you are subscribed to and will not send notification when a new member sign up in your forum. This is a security lapse gives an opportunity for the spammers to upload their spam content on your forum without your knowledge. 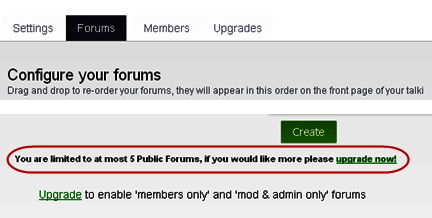 You can enable only one forum element per account which makes it difficult for users to have different forum on different sites. If you forget to delete the forum element in any of your site, spammers can easily post content without your knowledge. It is difficult to migrate your free Tal.ki forum to other forums. There is no dedicated URL to access your forum directly. In order to post a response you need to login using Weebly account or other social media like Twitter. Even Weebly Pro members have the same restrictions like free members. Upgrading to Tal.ki Pro or Platinum costs at least $5 per month where as Weebly Pro itself costs around $8 per month only. Unfortunately even an upgraded Weebly Pro member also has the same limited forum options like free account holder since the forum is controlled by Tal.ki and not by Weebly. I cannot find the FORUMS tab any longer in my Weebly build page. I have seen tons of online forums tutorials, but all of them say you drag FORUMS over to the page, but I do not see it. Is it paid only, I wonder. I don’t think so, because youtube tutotials show “Free” weebly is being used. After Carbon upgrade, Weebly removed the default forum element. At this moment either you need to use embeddable forums like Nabble or look for forum apps from App Center.